Ahem. Anyway, after Our Great And Most Glorious Leader’s post earlier today about having nothing to hand for the site for once, I took it upon myself to quickly bash something together in order to help uphold our nigh-unimpeachable record of journalistic quality and integrity. Either way, it’s a good enough excuse to jam out some fat and filthy blackened riffs whilst picking and choosing five of my favourite songs by everyone’s favourite cloven-hoofed courtesans of Satan. Not to put too fine a point on it, but for me A Haunting Curse is where the band really “found” themselves, and whilst both of their first two albums are still pretty good, I was definitely tempted to leave them unrepresented on this list… at least until I remembered how awesome “Baptized in a Storm of Swords” was. 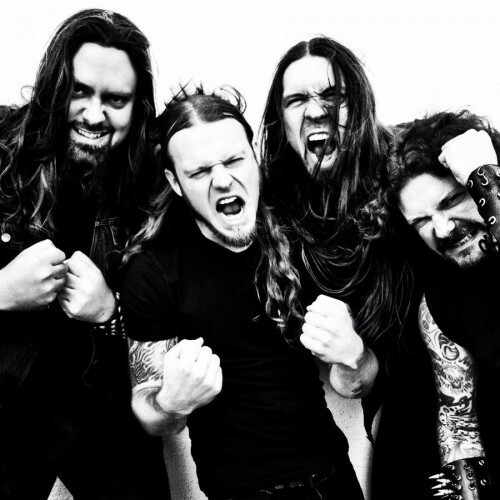 This track, more than perhaps any other, is basically the blueprint for the Goatwhore sound, filled to the brim with splattering blast-beats, chugging speed-metal riffs, tripwire tremolo runs, gut-rumbling grooves, and groaning, death-tinged heaviness. It also has some truly nasty vocal work (the cadaverous highs in the mid-section and the godless lows towards the end are particularly memorable) which really push the aggression levels to new heights. Now obviously both opener “Wear These Scars of Testimony” and closer “I Avenge Myself” would be the obvious choices here (and for good reason), but “Silence…” is a similar no-brainer in my book. I mean, the title alone! That opening, apocalyptic, spiralling riff! The unrelenting force that propels the song ever onwards like some hellbound, brimstone-fuelled locomotive! And then that out of nowhere, doom-laden second half! For a band who have, in the past, been accused of being too direct and too one-note in their delivery, this one certainly has twists and turns a-plenty. Here’s my confession – I’m actually not as big a fan of this album as most people seem to be. I know it’s a real crowd-pleaser, and a fan-favourite to many, but something about it just doesn’t click with me, despite the fact that it’s got an incredibly strong opening salvo of songs locked and loaded. Beyond this though it does have a few real stand-outs, particularly phenomenal closer “To Mourn and Forever Wander Through Forgotten Doorways” (which was almost included in place of “Baptized…”), and the brutal Black/Death assault of “In Legions, I Am Wars of Wrath”, which – along with possessing a wickedly melodic lead refrain in the second half – is probably one of the downright heaviest tracks the band have ever laid down. That RIFF. Seriously. That intro riff is potentially the best goddamn riff that The Goat’ have ever written. I could listen to it all day and never get bored of it. Of course the rest of the song is almost as awesome… but really… all you need is that RIFF! Have I mentioned how much I love that riff? We’ll end with a nicely out-of-character moment for the Louisiana blastmasters, namely the sludge-soaked, frostbitten crawl of “Cold Earth Consumed in Dying Flesh”. On an album filled with a smorgasbord of lethal cuts and pure metallic venom, this was/is the one that made the biggest impression, and although it’s not the first time the band have indulged their doomier tastes (“To Mourn and Forever Wander…” from Carving Out the Eyes of God plotted a similarly desolate path), this is by far the heaviest and most Celtic Frost-influenced track they’ve ever done. Plus it absolutely crushes live. I would never be able to pick five. I love them all too much. Have you heard anything from the new Ritual Killer album? Sammy is just a riff machine. I find it difficult to conceive of a world in which Goatwhore made any bad songs.